What Are Medical Alert Systems, and How Do They Work? Who Can Benefit From a Medical Alert System? How Much Do Medical Alert Systems Cost? Medical alert systems have come a long way since the old television commercials in which a kindly grandmother calls out, “I’ve fallen, and I can’t get up.” These systems, also referred to as personal emergency response systems, have a range of options for alerting emergency personnel or loved ones in the event the user needs help. If you or a loved one is elderly, at risk of falls, or has a health condition that may make it difficult to call for help using a landline or a mobile phone, a medical alert system may offer both peace of mind and practical connectivity. Medical alert systems use a call button to connect the user with the vendor’s call center. The call center will apply its protocols for determining the severity of the user’s situation, then either contact predetermined caregivers to check in on the user or send first responders via 911, depending on the circumstances. These systems do not connect the user to a hospital or doctor. Home-based units may operate through a traditional telephone landline or cellular service. The call button may be located on a base unit or additional mounted buttons in the home, a pendant or watch-style device the user wears, or a wearable mobile unit using GPS technology and a cellular connection. Mounted or wearable call buttons generally have a range of 400 to 1,500 feet from the base station, depending on the service, and thus are limited to use in and around the home. Mobile GPS-enabled units use a cellular phone connection and are designed for use on-the-go, so users with a more active lifestyle can still have the benefit of a medical alert system. When the system is set up, the monitoring service will generally obtain the user’s medical history and caregiver contacts to aid in evaluating how a call should be routed and to determine if first responders need to be sent as opposed to having a caregiver check in. Need help choosing a medical alert system? Read our buyer’s guide for our top picks. What Happens When the Call Button Is Activated? When the user presses the call button the system connects to the service’s call center. With home-based systems, the main base unit is in essence a powerful speakerphone through which the user and the call center dispatcher can communicate. For example, let’s assume that the user is close enough to the base unit to hear the dispatcher and respond. The call center dispatcher will speak to the user over the base unit speakerphone to determine what has happened. The user may simply be testing the system, which is recommended on at least a monthly basis, or testing the range of a wearable pendant or watch-style button to determine if it will operate if he or she is in the garden, a basement, or other location around the property. The user can easily tell the dispatcher that she was testing the unit or had accidentally activated it, and the call center can reset the system remotely. Testing and false alarms are common occurrences and expected by the call centers, so they’re simply part of the process. Now let’s assume the user may have fallen and just needs help getting up, not an ambulance. These systems offer a way for the user to call one central service for assistance. The service can then reach out to listed caregivers to locate one who can help the user, thus avoiding the significant expense of dispatching an ambulance unnecessarily. At the same time, people needing care sometimes feel like a burden and may underreport or attempt to minimize the severity of a situation, especially if the only people to contact are family-member caregivers. Call center dispatchers are typically trained to evaluate the situation to determine the appropriate response level, and because users know they are paying for the service, there may be less hesitation to reach out. It’s always good to remember that the “right service” or product is the one you’ll use. Now let’s assume that the user presses the call button but is not within earshot or speaking range of the base unit — a situation that could easily happen. For example, the user may have slipped in the shower and activated his pendant or watch to call for help, but the base unit is on a different floor of the house. In such situations, the call center will need to follow a protocol based on the user’s living situation and medical conditions to determine whether a caregiver should be dispatched or first responders should be sent right away. How situations like these are handled is an important discussion to have with potential vendors to make sure a system fits with the user’s particular circumstances and needs. For an additional monthly fee, some services offer fall detection built into the pendant. Fall detection operates by sensing the fall and impact and then a lack of movement for a certain period of time, which may indicate that the user is unconscious or otherwise unable to move. Falls are among the most common medical emergencies in the home and among the most common causes of concussions (also known as TBI, or traumatic brain injury). 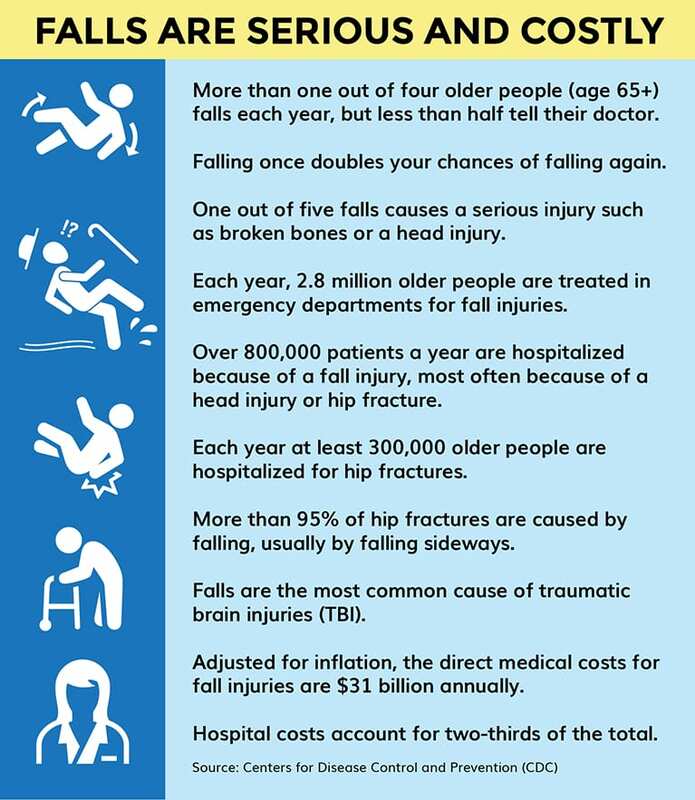 According to the Centers for Disease Control and Prevention, nearly four in five emergency room visits, hospitalizations, and deaths related to traumatic brain injury in adults 65 and older were caused by falls. Falls are also a leading cause of death in those 75 and older. If the user is at a heightened risk of falling because of mobility or balance problems, or if the user is especially vulnerable to injury in the event of a fall (for example, she has osteoporosis), fall detection may be worth the extra cost. Since it may be more likely than not that a user calls for help when outside of hearing and speaking distance of the base unit, it is prudent to consider a system that offers portable two-way communication units. These may be available with a home-based system or a GPS-enabled cellular-connected system. Home-based systems work with a wearable pendant or watch-style call button and a base unit in the home, but its portable unit acts like a small cordless phone with a two-way speakerphone. Like a cordless phone, the portable unit needs to be within range of the base station, but it integrates a speakerphone and call button in a small unit approximately the size of a beeper. This may be a useful option when the user is outside in the yard or in a room within the home that is not near the base unit. For example, the user could still wear her pendant to call for help while showering but set the small two-way unit on an adjacent counter to have two-way verbal communication with the call center in the event of an emergency. Fully mobile GPS-enabled cellular-connected units are not limited to use in the home and already integrate two-way communication into the unit that is carried or worn by the user. However, these systems generally cost more per month, so if the user is primarily homebound, a home-based system with two-way pendants may make more sense. For home-based systems, you may also want to consider whether it’s possible to use a lockbox for a house key. By placing a key in a lockbox that the monitoring service has the code to, emergency responders will be able to enter the home easily, without damaging windows or doors. Read our Medical Alert Systems Buyer’s Guide for more. 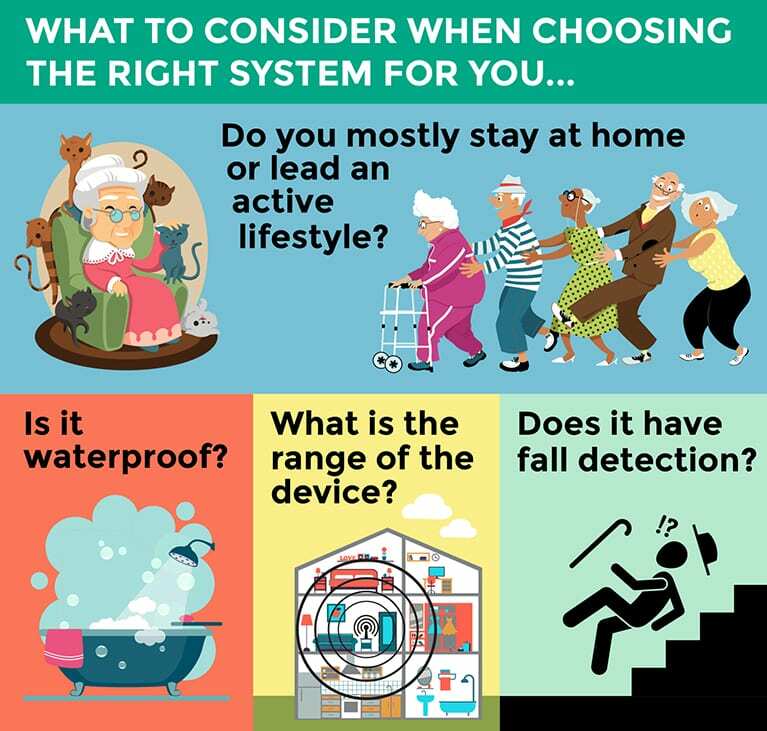 When we consider these systems, we naturally think of elderly people who may be injured or unable to get up after a fall. My great uncle, who lived alone, was in his nineties when he fell in his garage. His mind was sharp, but he had sustained broken ribs in the fall and couldn’t get up. The garage was windowless and there was no telephone to use even if he had been able to reach it. He was trapped there for three days, until one of his tenants came looking for him to pay her rent. She heard a faint tapping at the garage door, found him, and called an ambulance. Our family was very lucky that he survived. This is a classic example of a situation that could have been resolved in minutes instead of days with a wearable call button or a fall-detection monitor. Medical alert systems aren’t necessarily only for the elderly or chronically ill. Last summer, I began having increasingly severe abdominal pain. I lived alone and had only one regular visitor who could notice if something was amiss. After several days, I had become so weak that I struggled to walk to the mailbox on the street and almost fell trying to climb the steps to the porch. Later I fell getting up from the couch and couldn’t think clearly because of the extreme pain. I eventually managed to drive myself to the emergency room, where I was prepped for surgery within an hour to remove my ruptured appendix. Being in my mid-forties and not having a chronic condition requiring monitoring, I wouldn’t have thought to have a medical alert system “just in case” a fluke medical emergency arose. But during the lengthy recovery that followed the surgery, I wished I had one. I was still very weak, had an open wound for six weeks, and was not permitted to lift more than 10 pounds. We take for granted that we can use a cell phone to call for help, but there are many assumptions wrapped up in that view, including that you are conscious and have the manual dexterity and mental focus to unlock the phone and dial someone — even that there is cellular reception. Even if a person is living in a retirement home or a long-term care facility, a medical alert system may still be a useful service. Although these facilities may have call buttons and pull cords on the premises, they may not be located where falls occur and only alert personnel within the facility rather than contacting a call center, and the resident has to rely on the facility to properly maintain the system and respond when there is an alert. Having an independent medical alert system with the ability to reach family or other caregivers or dispatch first responders may well be worth the extra cost. It’s better to be safe than sorry. Check out our Medical Alert Systems Buyer’s Guide to find the best system for you. There are three main medical alert systems with slightly different installation procedures: home-based landline-connected, home-based cellular-connected, and mobile GPS-enabled cellular-connected. To install a home-based landline-connected system, you plug the base unit into both a power source and a wall telephone jack. When selecting a location for the base unit, consider maximizing the range of the unit. You may also locate the base unit in the room where the user spends the most time so that he or she is more likely to be within speaking and hearing distance of the speakerphone. To install a home-based cellular-connected system, only a power source is needed. The cellular connection is included as part of the system and unrelated to one’s mobile telephone cell service. The pendant or mounted call buttons still connect to the base unit wirelessly, but not over the cellular connection, so making sure the base unit is within range of the call buttons is still important. To install an on-the-go GPS-enabled cellular-connected system, only a power source is needed. The cellular connection used is included as part of the service and is unrelated to one’s mobile telephone cell service. On-the-go units need to be regularly charged like a cell phone, and the wearable pendant or watch-style call button generally needs to be within 100 feet of the main unit. Visit our buyer’s guide to find the best medical alert system for you or your loved one. The most basic decision you will need to make in selecting a medical alert system is whether it will be home-based or mobile. If the user is homebound or leaves the home only with a caregiver, the additional expense of a mobile system may not make sense. However, if the user is relatively active and leaves home on a regular basis for daily outings or longer-distance travel, a mobile unit may be well of value. Considering that seniors are staying more active later in life and that social interaction and physical activity is mentally and physically beneficial, having an on-the-go system may allow the user to feel more independent and healthier while still ensuring that an emergency alert is at hand. Mobile units connect the user to the call center via a cellular connection, which requires the user to have reception on that service at the time, but GPS technology is generally independent of WiFi or cellular data connections. Even if the user is without a cellular connection to request help using the call button, or is mentally or physically unable to activate the call button, the GPS-tracking feature can still be used to identify her exact location. Recently a Silver Alert went out in my area for a senior with dementia who was missing. Sadly, he was found deceased near a local airport a week later. When I was in high school, my mother and I visited my elderly grandfather in his nursing home. When we arrived, we were surprised to find that my ninety-something grandfather had packed his suitcase and was donning his coat and hat. We asked him where he was headed, and he said he’d received a call that they needed him back up in Minnesota to break some horses. He may have received such a call some 60 years earlier, but severe Alzheimer’s made it impossible for him to remember who we were or what he ate for breakfast, although the distant past seemed crystal clear. He was still active enough that he could have walked right out the door and disappeared. In situations like this, where the user may not be able or want to activate a call button, having GPS-tracking technology to locate the him may very well save a life. What Is the Range of Home-Based Systems? Most systems have an operating range for call buttons of 300 to 1,500 feet from the base station, but the average is closer to 400 to 600 feet. Walls and floors may reduce signal strength — and therefore the operating range — of a call button, so it is important to test the system in various locations both within the home and in the surrounding yard where the user may spend time. If the user lives on a large property, the system’s range needs to be a critical factor in deciding between different services. Can You Travel With the System? GPS-enabled on-the-go systems are designed to accompany users as they travel locally or farther afield within the United States (assuming there is a cellular connection available). However, some home-based systems may also be moved. Being able to move the home-based cellular-connected unit from a home to a retirement facility, a family member’s home, or a vacation spot is a useful feature for those people who do not wish to be tied to a landline connection. The critical feature for a medical alert system is having a call button that is readily reachable for the user in the event of an emergency. Wearable necklace-style pendants and watch-style call buttons are the most common and practical in that they’re less likely to be separated from the user once they are put on. Most but not all wearables are waterproof. Because showers and tubs are high-risk areas for falls, having a waterproof wearable is a must-have to get the most benefit from these systems. The majority systems offer fall detection functionality within a wearable pendant, at an additional monthly cost. A wearable is only good if the user wears it. If the user is not able to fasten the watch band due to arthritis, it won’t help in an emergency. In deciding between pendants, watch styles, or small hand-held units that can fit in a pocket, it is important to consider the user’s lifestyle, dexterity, and comfort. Although not wearable, many systems also offer the option to install additional call buttons in areas of the home where an emergency call is more likely to occur — for example, near the tub or toilet, beside the bed, or at the bottom of a stairwell. Such call buttons still need to be within range of the base unit. The main maintenance issues for these systems are ensuring there is sufficient battery backup in case of a power outage (many units come with more than 24 hours of battery backup capability), that batteries are working in call buttons (some services will notify the user when a battery needs replacement), and that mobile units are charged regularly, similar to a cell phone. The hardware is generally owned by the service and leased by the user, so a malfunctioning unit would be replaced by the service rather than the user needing to have it repaired on his own. While most U.S. medical alert systems operate their own emergency response call centers, it is not the case with every provider. That a call center is not company-operated does not necessarily mean it isn’t as good, but for a service that relates to health issues and rapid response, it may be preferable that the company has control over and responsibility for the call center and the hiring and training of employees staffing it. Some call centers are also certified by Underwriters Laboratories, indicating that they meet certain standards for reliability; you may want to look for a service that is UL certified or has a similar approval by a recognized independent authority. Take the next step to choosing a medical alert system and visit our buyer’s guide. Systems range in price and are generally billed as a monthly recurring cost. Rates range from $20 to $50 per month, depending on the service and selected features. Even a GPS-enabled on-the-go system can be found for less than $40 per month. Some services charge activation fees, but many waive them for promotional offers or do not charge them at all. As this is primarily a service for users who may become gravely ill and no longer need the service, it makes sense for consumers to avoid up-front costs as much as possible. In general, the monthly recurring charges include both the service and the equipment all bundled together. Because equipment is company-specific, it makes sense to lease the hardware together with the service and simply return the equipment when you cancel the service (similar to renting a WiFi router from the cable company and returning it if one changes to a new provider). What Are the Cancellation Terms for the Service? Most services are available on a month-to-month basis, which is probably what users should look for. You don’t want to be tied to a long-term (even annual) contract in case the user enters a nursing home or dies and the service is no longer needed. A service that doesn’t appreciate that and wants to lock the consumer into a long-term contract may not be the right fit. Are Medical Alert Systems covered by Insurance, Medicare, or Medicaid? According to the Federal Trade Commission, most insurance companies, Medicaid, and Medicare are unlikely to cover the cost of medical alert system hardware and monitoring and if covered, require a doctor’s recommendation. For more information and additional tips for being a savvy shopper when selecting a medical emergency response system, see the FTC article on personal emergency response systems and the AARP overview of such systems. Are Medical Alert Systems Tax-Deductible? As with most things tax-related, consult your accountant or other tax professional to determine whether you may deduct the cost of a medical alert system from your state or federal income taxes. Read the Internal Revenue Service’s Publication 502 on medical and dental expenses for additional guidance. To be deductible, a system may need to have been recommended by your doctor. Be aware that with deductible medical expenses, you generally must itemize the deductions, and the expenses are only deductible over a defined threshold based on your adjusted gross income. Check with your private health insurer or tax professional to find out if an alert system is a qualifying medical expense under a pretax health savings account. Is a home-based or an on-the-go system a better fit? If choosing a home-based system, is there a landline or does the service’s cellular provider have strong reception in the desired location? What features do you want in the portable or wearable call buttons; for example, should they be waterproof, have two-way communication capability, and/or have fall-detection functionality? Is the emergency call center U.S.-based and operated by the vendor? What are the up-front and recurring monthly costs? Are you locked into a long-term contract, or does is the service offered on a month-to-month basis and cancellable when circumstances change? Do your research: Read many reviews and be aware that some of them may be sponsored by a company or the industry and not entirely objective; ask family and friends if they have recommendations on services; call companies and ask them the hard and detailed questions their website or advertisements may not cover; and always read all of the fine print. 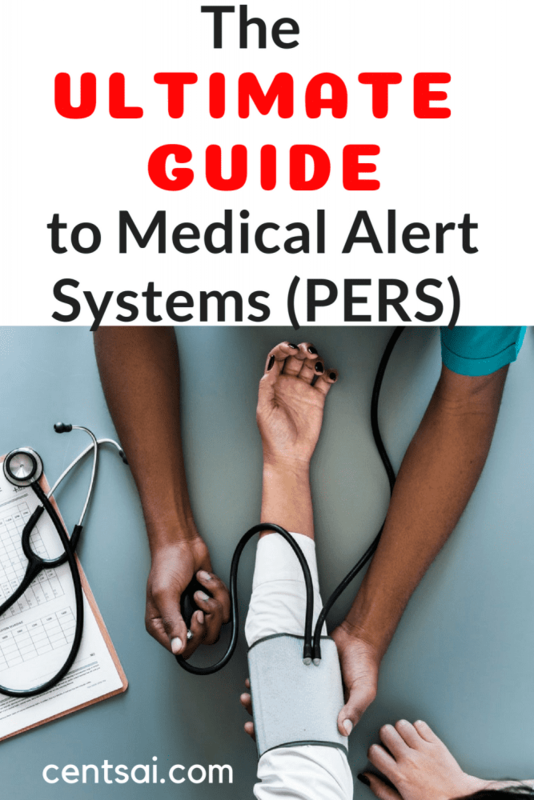 See our Buyer’s Guide on medical alert systems for more information. The National Institutes of Health offer guidance for determining whether an elderly friend or relative needs help. Additional resources for the elderly and caregivers may also be found through the Department of Health and Human Services’ Eldercare Locator.